They say breakfast is the most important meal of the day. And that means it's imperative that the first thing that greets your palate be delicious. Otherwise, you may skip breakfast, or wolf down a few glazed doughnuts and be famished a couple of hours later. No risk of that happening when breakfast is infused with big, bold flavors. International breakfasts — the morning meals that are popular in Ecuadorian, Balkan, Cuban, Turkish, Scottish and Chinese cultures, to name a few — are a fascinating and scrumptious way to start a day. Here are an assortment of breakfasts — and the restaurants that serve them — recommended by professional chefs and consummate food lovers. What do you do with leftover arepas, chorizo, rice and beans? If you're in the Andean region of Colombia, you reheat your leftovers, top it with one or two fried eggs and, ¡ya esta!, breakfast. Called "calentado," which means heated, this hearty dish can be found in just about any traditional Colombian mom-and-pop shop. 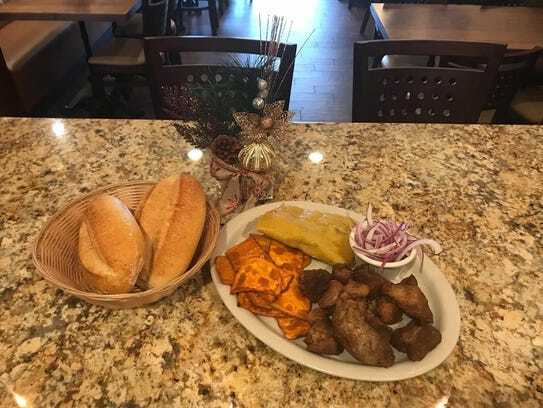 In North Jersey, chef and owner Galo Grijalva of Empanada Mania in Bergenfield says his go-to spot for the dish is Noches De Colombia in Englewood. He was introduced to the dish by his Colombian friends while growing up in Ecuador. The dish is terrific, he said. However, the best part is, Grijalva said, "the hot chocolate" that many Colombians order with it. "It is made with broken down pieces of chocolate, heated in milk with cinnamon and sugar and pieces of cheese thrown in so they melt." Go: 90 W. Palisade Ave, Englewood; 201-567-4950. Other locations: 210 Madison St., Passaic, 973-955-0000; 370 US Highway 46, S. Hackensack, 201-880-7476; 382 Main St., Hackensack, 201-880-8344. Also, Lincoln Park, Clifton, Montclair, Fairview, North Bergen, West New York, Jersey City, Randolph and Belleville. nochesdecolombia.com. Some might consider a tart filled with creamy egg custard dessert, but Korean-American Robert Austin Cho, owner and pit master of popular barbecue restaurant Kimchi Smoke in Westwood, calls Dan Tat, a Chinese baked pastry, breakfast. "I consider them breakfast like I consider bagels or a croissant breakfast," he said. "The pastry has a mushy egg custard filling with a flaky exterior, which is just dense enough to hold everything together," he said. He enjoys it at Chinese supermarket Kam Man Market, which has an eat-in-bakery and a counter for enjoying the prepared foods it produces. But of course Dan Tat is best eaten in the morning, Cho said, when they are fresh out of the oven. Whenever Cho finds himself at Kam Man, he makes sure to wolf down a fresh Dan Tat, along with Bolo Bao, a Chinese pineapple bun, and Char Siu Bao, Cantonese steamed pork buns. He washes it all down with a cup of coffee. And the breakfast is easy on his wallet too: Each pastry costs from $1.25 to $2. Go: 200 Route 10, East Hanover; 973-503-1770, kammanmarket.com. Snezana Milia, Cafe Bubarama's owner, hails from Montenegro, and calls przenice (pronounced projenees) "the main breakfast my mother and her mother's mother made." Her darling 3-year-old cafe specializes in the foods of the Balkans. How is przenice, aka Balkan french toast, different from American french toast? "We fry our bread in oil, we don't grill it," Milia said. Plus the toast — multigrain if it is served with sweet jam and fruit; thick white bread if served with savory ingredients — is brushed with an egg wash, not soaked in eggs. 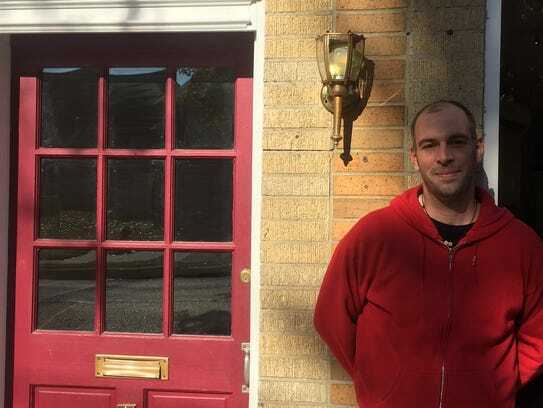 Kenny West, a Clifton resident and sous chef of Orama restaurant in Edgewater, is a huge fan of Bubarama's przenice, especially the thick toast served with Bulgarian feta and smoked beef prosciutto ($8.25). Or, sometimes, he orders another specialty of the house: burek, filled pies made with flaky phyllo dough. The house-made pies can be filled with meat, cheese, vegetables; West's favorite is filled with mashed potatoes ($6 personal pie; $3.75 mini-pie). And everyone knows to order the homemade yogurt ($2.50 small; $3.50 large) to drink. "Ninety-nine percent of the people drink yogurt with it," Milic said. Go: 263 Parker Ave., Clifton; 973-928 1371, cafebubamara.com. Guatemalan-born Carlos Valdez, executive chef of The Oceanaire Seafood Room in Hackensack, grew up eating beans and eggs for breakfast. So is it any wonder that his favorite breakfast is huevos rancheros, the classic Central American and Mexican dish that originally was enjoyed on farms (it means rancher's eggs)? Composed of fried eggs served on fried corn tortillas dressed in a simple tomato and chili sauce, and often accompanied by fresh avocado, huevos rancheros can be found on the menus of diners, cafes and even white-tableclothed restaurants. Valdez loves the version served at Raymond's because, he said, it is obvious to him that "the dish made it onto the menu from someone in the kitchen staff." In other words, a fellow Latin American. He said his daughter has watched him order it so many times that she eventually started ordering it — and now it's her favorite breakfast, too ($14). Go: 101 E.Ridgewood Ave., Ridgewood; 201-445-5125; and 28 Church St., Montclair 973-744-9263, raymondsnj.com. Arepa, a flat patty made of ground maize, is eaten practically all day long in Northern South America — and of course in the morning. But, that's no reason not to upgrade this commonplace and classic Latin American dish with perfectly poached eggs, grilled chorizo, melted Manchego sheep cheese and pimento-flecked Hollandaise sauce. Which is how you'll find the dish at colorful Chit Chat Diner in Hackensack, a favorite breakfast meal of Bogota resident Ralph Perrotti, chef of Atlas Public House in Jersey City. "I am all in with anything that involves chorizo," said Perrotti. In addition to Benedict Arepa ($12.95), he recommends Chit Chat's huevos rancheros ($10.95) — with chorizo. Go: 515 Essex St., Hackensack; 201-820-4033 chitchatdiner.com. 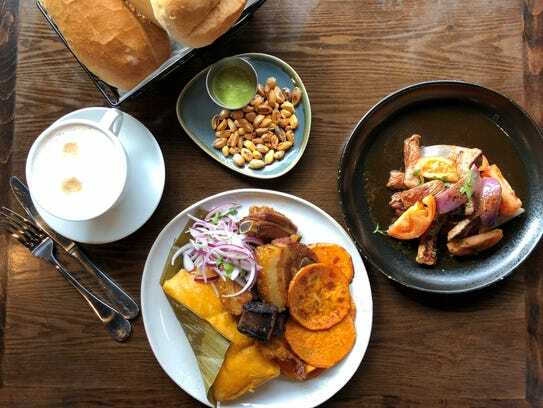 Chicharrones (fried pork belly), relleno (Peruvian blood sausage) and camote (yam chips) is what Lima-born, CIA-trained chef Jan Placencia craves for breakfast on weekend mornings. It's a hearty dish (actually dishes) — and just to ensure it supplies enough carbs it's often served with pan frances (fresh rolls). 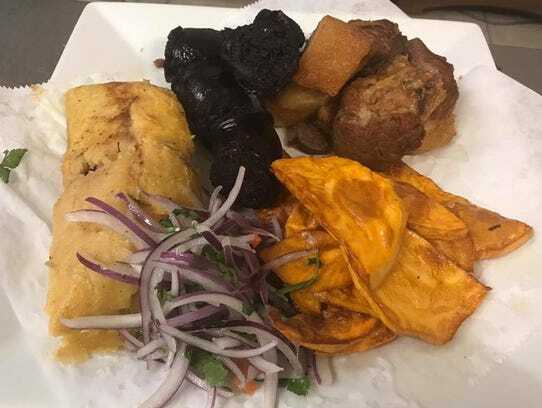 This combination breakfast or combinado lurin is served in many Peruvian restaurants, noted the Lyndhurst resident, who is set to open Somos, a Peruvian/fusion restaurant in North Arlington sometime next month. But he admits he has a soft spot for his parents' restaurant Oh! Calamares in Kearny, where the dish is available on Saturdays and Sundays beginning at 10 a.m. Cost: $13. And the drink of choice: cafe con leche, of course ($2). Go: 102 Kearny Ave, Kearny; 201-998-4111, ohcalamaresnj.com. Go: Istanbul Borek & Kebab, 360 Lawton Ave., Cliffside Park; 201-945-3030, istanbulborekkebab.eat24hour.com. Outside of the United States, breakfast tends to lean more savory than sweet — like England’s grilled tomatoes and baked beans or Israel’s shakshuka. The same is true of Scotland, as Ian McAndrew recalls.“While my kids were growing up, I was fortunate enough to have them all try different Scottish foods without much pushback,” said McAndrew, who owns Cameron’s Scottish Foods in Brick. “On Sundays, when we would have a family breakfast, I would cook them Scottish sausage, potato scones, eggs, and black pudding. Once I finished making breakfast, we would all sit at the family table and enjoy our time together, telling stories and laughing." 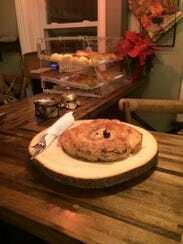 At his store, McAndrew sells potato scones and black pudding, a sausage made with onions, barley, oats, spices, salt and beef blood, plus other Scottish specialties. Go: Cameron’s Scottish Foods, 284 Brick Blvd. in Brick; 732-920-0006 cameronsscottish.com. Shakshuka, a heady dish of poached eggs atop a spicy slightly sweet tomato sauce, is the Middle East's gift to breakfast lovers. Who can resist sopping up the delicious red sauce with a slice or two of bread? 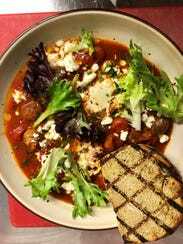 For brunch at popular casual Mediterranean spot MishMish, Israeli-born chef Meny Vaknin gilds one rendition of his shakshuka (he offers four varieties) with lamb mergueze sausage ($14), because (1) he could and (2) it works. "The sweetness and the savory flavor of the sauce benefits from the fat and full seasoning of the lamb," Vaknin said. Food fan Michael Sinatra, who worked at Whole Foods Market for nearly eight years, can't forget the deliciousness of MishMish's lamb mergueze shakshuka. "I only had it once but I am always thinking about it," he said. La Isla, a funky Cuban spot in Hoboken, is famous for its French toast — it has been featured on TV — but for Hoboken resident and fervent food lover Michael Sinatra, it is the omelette with sweet plantains ($10) that is the real star of morning eating at La Isla. "Perhaps my favorite omelette on earth," he declared. Get it with a side of Cuban coffee and cafe con leche. Boonton has 22 eateries, said Chris Manzella, the outgoing executive director for Main Street Boonton. You can get just about any cuisine here — but only a few places are open for breakfast. One that is open — and good — is Sazon Latino. Everything in this spot is cooked by chef-owner Gerardo Lagos of Hondurus. Help yourself to a tray, tell Lagos what you want, wait for him to cook it and then place it on your tray, grab yourself a seat and enjoy. "Every day is a different offering," Manzella said. "It's quite unique." Anything that she likes best? "To be honest with you, most of the time I just point." 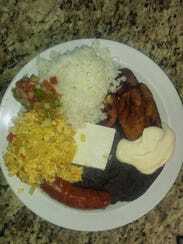 On offer always are the usual Central American staples: plantains, arroz con pollo, chorizo, etc. But do try the breakfast burrito, a soft tortilla with sour cream, rice and beans, cheddar and pepper Jack cheese with your choice of pulled pork or chorizo ($5). "Everybody likes it," Lagos declared proudly. Go: 209 Main St., Boonton; 973-794-4121, no web site. In Costa Rica, breakfast is the biggest meal of the day, and that is certainly reflected on the menu of the Division Café in Somerville, which features tons of breakfast favorites including gallo pinto, a Costa Rican traditional breakfast of stir-fried rice, beans, cilantro, onions and peppers accompanied by sweet plantains, a fried egg and a slice of cheese. 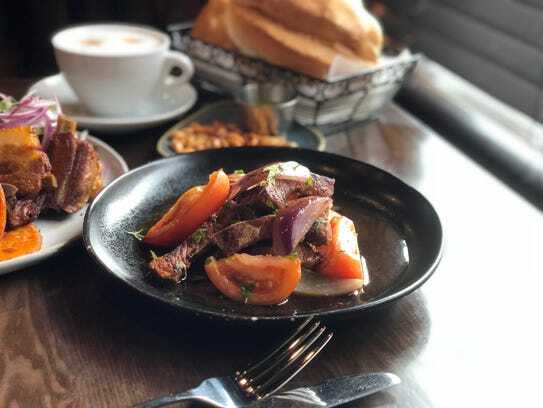 “This dish is very unusual to other cultures and it really represents Costa Rica,” said Steffany Granados, marketing manager at the Division Café and daughter of the owners. “Our Costa Rican clientele really loves our gallo pinto and our American customers find it interesting and different.” Traditionally, gallo pinto is made of the leftover rice and beans from last night’s meal tossed in with whatever else is available, explained Granados. “Everyone has their own way of making it,” she said. Plus, aside from it being tasty and filling, the dish caters to everyone since it can be vegetarian or meat can be added to it. $7.95, add $3.95 for grilled chicken or $4.95 for steak. Go: 8 Division St., Somerville; 908-450-7979, divisioncafe.com. Go: 1576 Irving St, Rahway; 732-900-1396, saborp.wixsite.com/saborperuano. 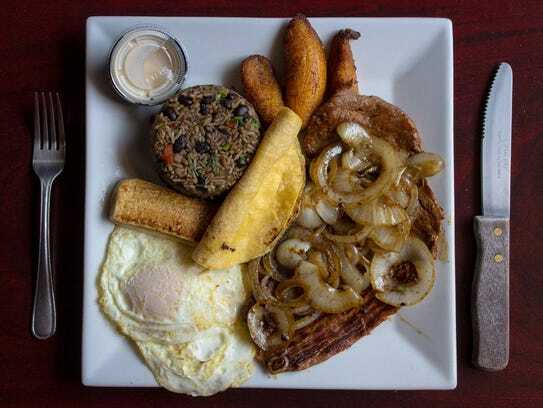 For Jay Lopez, chef and owner of A Little Bit of Cuba Dos in Freehold Borough, breakfast reminds him of his childhood. “While growing up in Cuba, I looked forward to the weekend, when we would visit my ranch, or rancho, as we say in Spanish,” Lopez said. “Everything we would eat there was the freshest you could get. 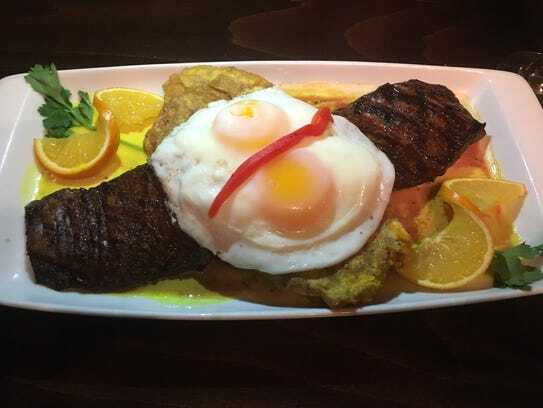 My favorite breakfast was the Cuban version of steak and eggs — grilled skirt steak topped with two eggs, sunny-side up, and a side of tostones, or fried plantains. 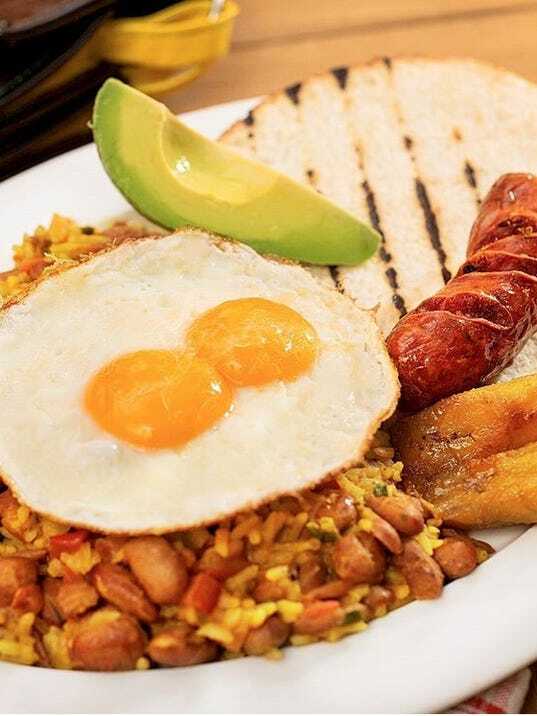 We also ate arroz criollo, rice topped with a fried egg, beans, avocado and maduros, which are sweet plantains. Even though they’re technically breakfast dishes, I find myself craving them at any time of the day! 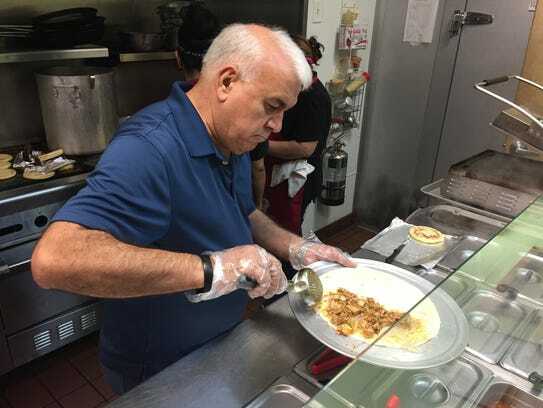 The flavors really bring back memories.” Lopez’s restaurant does not serve breakfast, but if a diner would like to try these dishes, he will prepare them during lunch and dinner service. Go: 2 E. Main St., Freehold Borough; 732-577-8506; alittlebitofcubados.com. Go: 2143 Woodbridge Ave., Edison; 848-202-9366. 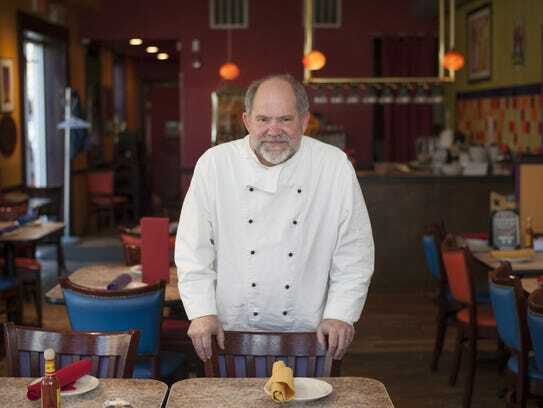 Chef-restaurateur Mark Smith, who owns Tortilla Press in Collingswood, a BYOB, and Tortilla Press Cantina in Pennsauken, grew up in the Midwest, where he offers Mexican and Southwest-influenced, seasonal cuisine. His favorite breakfast haunt is a South Jersey landmark, The Kibitz Room, a New York-style deli. "I'm originally from Ohio so when I arrived in South Jersey, exotic brunch food to me meant lox and bagels," he said. "The bagels I was used to in my home town were frozen or packaged ... not the lush, crusty ones in every kind of variety possible that I saw all around me in South Jersey. I'd frequent whatever bagel place was closest to me and then finally discovered the Kibitz Room in Cherry Hill. I think they took pity on me as an unenlightened Midwesterner. They introduced me to bagels with lox and cream cheese — pretty much heaven. Then they suggested I try whitefish, which I absolutely loved. I can't get away with serving it at the restaurant -- nothing less Mexican or Latino than whitefish. But oh, if I only could..."
Go: 100 Springdale Road, The Shoppes at Holly Ravine, Cherry Hill; 856-428-7878, greatpastrami.com. Go: Moore Bagels, 65 E. Route 70, Marlton; 856-334-5091, moorebagels.com. Reza Ghassemi and Mirna Castillo, husband and wife, are owners of the newly opened Andalé Latino Grill in Marlton, with an original location in Feasterville, PA. He is from Iran and she is from Honduras. The fast-casual concepts features Latin fare from 21 Spanish-speaking countries, from tacos to arepas. The couple lives in Philadelphia, which is where they get tempted to treat themselves to a special breakfast. “On weekends when my wife wants something authentic for breakfast, we go to Sabor Centroamericano, off Rooselvelt Boulevard and C Street. 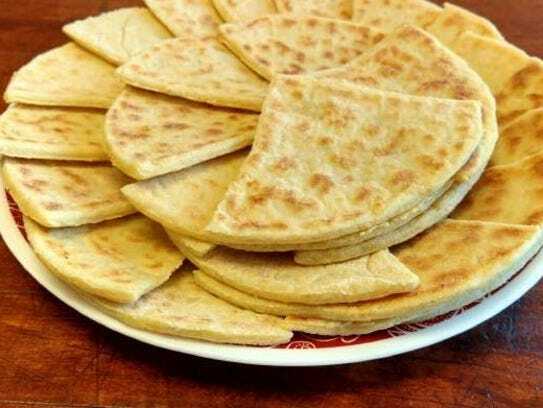 Her favorite breakfast, other than the authentic pastries, is baleadas.’’Baleadas are a classic Honduran dish made with a thick flour tortilla. Traditionally, it gets filled with mashed fried beans. Other ingredients might include avocado, sausage, plantains, chicken or pork. Baldeadas Mixta includes scrambled eggs.